LXXX 5./Festungstammsabteilung, Leutnant Ehmann in command. 1 x R139 a 1939 designed casemate for 4.7cm + a heavy machine gun. 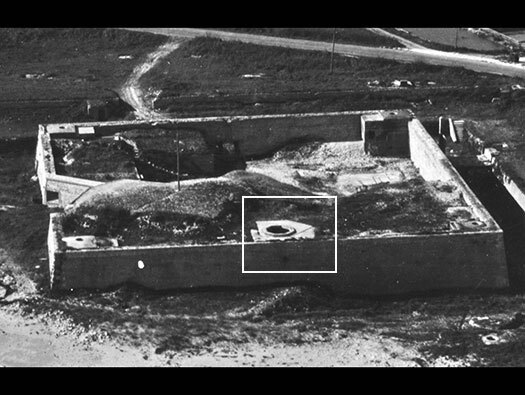 1 x R502 twin group bunker due to be built in 1944. 1 x R612 casemate for a field gun. 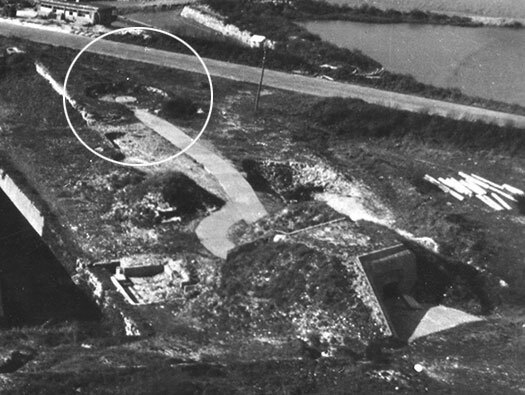 1 x R667 casemate for the 5cm KwK gun due to be built in 1944 to replace the Vf221. 1 x Vf221 ringstand for a 5cm KwK 38/39. 1 x Geschützstellung (open emplacement) for the 7.5cm F.K.231(f). 1 x 4.7cm Pak K.36(t) co-axle Vz 37(t) machine gun. 1 x s.MG 34 in a fortress mount. 1 x 5cm KwK 38/39. The bridge to the Ile de Ré. Blue : Vf221 ringstand for a 5cm KwK 38/39. Black : H612 with adjoining roadway to a gun platform. 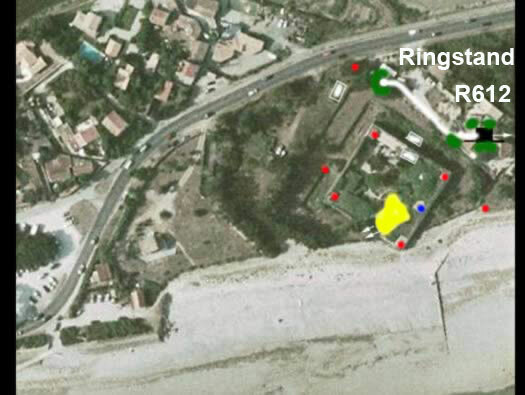 Three white squares are the site of barracks (probably wooden). Also an R502 and an R667 were to be built. 2 - Close combat defence. 4.7cm Pak K.36(t) better known as a 4.7cm Skoda gun. 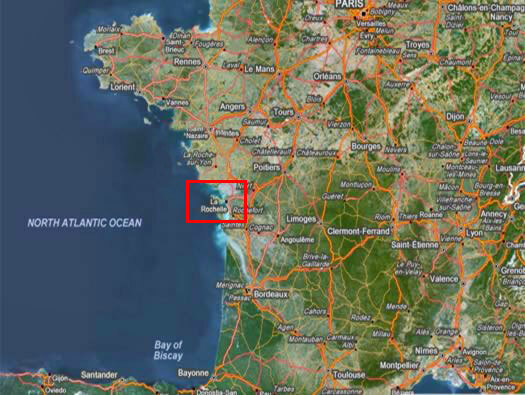 This is a German map of the Ile de Ré showing all the defences. 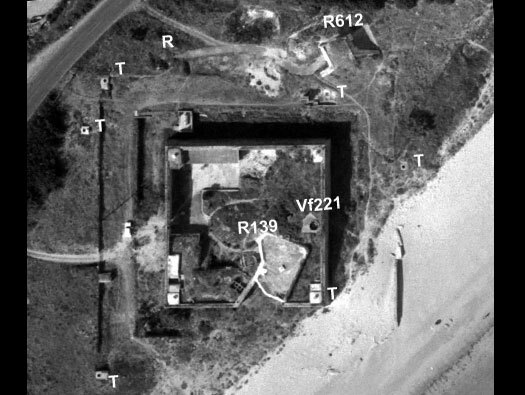 This defence Ro422 has been superimposed on an old French fort of 1674 vintage that was built would you believe to keep out the English. 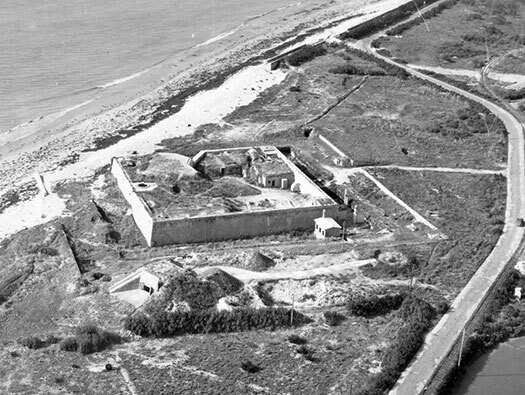 They have used the four corners with Tobruk's, placed a Vf221 5cm Pak inside and then cut out the corner of the forts wall and placed a very rare bunker in its place. This R139 is a February 1939 designed bunker more for the west wall but as the Kriegsmarine were building bunkers earlier than the Heers (army) they tended to use the older bunker designs. This is the only one left out of possibly four that may have been built. Also it is 'in mirror'. Meaning the design has been flipped horizontally. The plan shows the layout inside with two gun rooms, one for a 4.7cm Skoda Pak and a heavy machine gun behind 78P9 plate. 78P9 plate for an M.G. 34 machine gun..
7.93mm M.G.34 machine gun behind its 78P9 plate. 4.7cm Skoda ball joint fitting as seen from the outside.. The next four pictures scan from left to right. The outer wall on the far left has a Vf58c Tobruk covering the main gate entrance into the outer fort. This is the second picture showing the inner forts wall, above the corner is another Tobruk. This is the right side with the R139 built into the fort. A machine gun embrasure built into the wall. R139 casemate. Skoda 4.7(t) on the left an M.G.34 machine gun on the right. Skoda 4.7 Pak gun shield down. Skoda 4.7 Pak gun shield moving up. Skoda 4.7 Pak gun shield closed off. The mechanism to raise and lower the shield. Commander looking through the viewing slot. Fitting in a steel plate. 1 x Vf221 ringstand for a 5cm KwK 38/39 Pak. Plan of a Vf221 mortar Tobruk with an ammunition room and a small crew space. 1 x R612 + 1 x Geschützstellung circled . 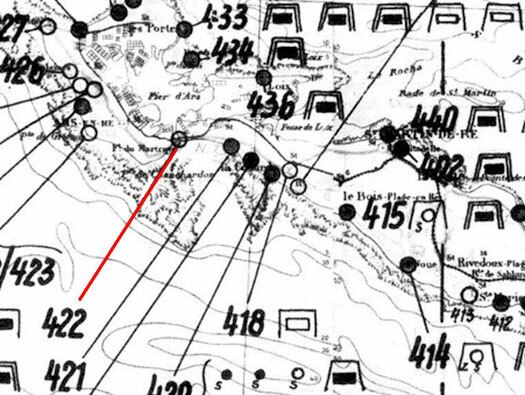 Circled is the original open emplacement for a 7.5cm F.K.231(f) and in 1944 a casemate R612 was constructed after Hitlerâ€™s order to casemate all artillery. 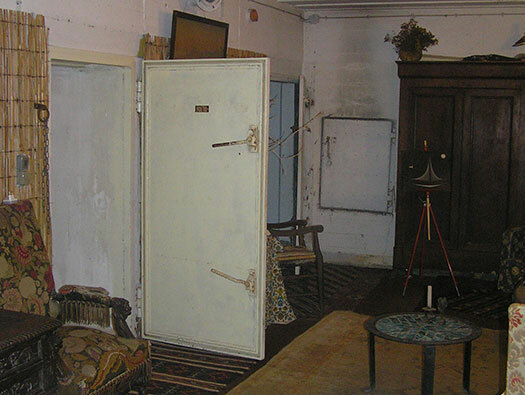 R612 with a flanking wall. Casemate with its gun in place. Plan of the pipe work to remove foul gasses from the gun room after it is fired. A 7.5cm F.K.231(f) in a Geschützstellung (open emplacement). A lovely post war picture of Ro422 from the air, nicely showing the R612 and its Geschützstellung and most of its defences. Gun firing in an open emplacement (Geschützstellung).